A fun (and inexpensive) way to distress edges is to scrape your scissor blade along them before inking. I like your favorite things very much. it makes a wonderfully vintage card. 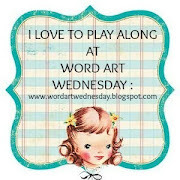 Thank you so much for entering your creative and beautiful art in our challenge at Word Art Wednesday. Absolutely stunning, my friend! I always love seeing your handmade cards. Hugs! Just Beautiful, I love the look of old postcards on cards, don't know why I don't use them more, the distressing is a great look for it and your flower is so pretty with it!